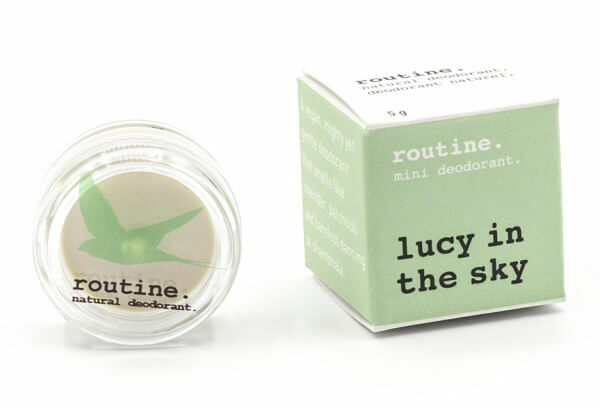 Routine De-Odor-Cream Natural Deodorant in Lucy in the Sky is a vegan clay formula. The scent is a bright and refreshing spa-like scent with lavender top notes. Directions: Gently smooth a pea size amount onto underarms (or feet). As routine contains no artificial stabilizers, consistency may change with temperature variations but will remain effective (best if stored at approx. 20°C). May cause irritation to freshly shaved underarms or sensitive skin. Ingredients: cocos nucifera (coconut) oil, magnesium hydroxide (dietary magnesium), zea mays (corn, non-gmo) starch, kaolinite (kaolin clay), maranta arundinacea (arrowroot powder), sodium bicarbonate (baking soda), hydrogenated olive oil, olea europaea (olive) fruit oil, olea europaea (olive) oil unsaponifiables, theobroma cacao (cocoa) seed butter, calendula officinalis (marigold) infused olea europaea (olive) oil, tocopherol (vitamin e), butyrospermum parkii (shea butter), lavandula officinalis (lavender) oil, hectorite (hectorite clay), brassica glycerides (natural cruciferous vegetable emulsifier), pogostemon cablin (patchouli) oil, azadirachta indica (neem) oil, vanilla planifolia oil, rosmarinus officinalis (rosemary) leaf oil. Consult your health care practitioner before using if pregnant or breastfeeding due to essential oil content. I want to love this product so much! It smells great, works great to control odour and wetness too. BUT it's not your friend if you have sensitive skin. It's given me quite the rash, and I've tried reducing the amount used as other reviewers have mentioned. LOVE this product!! It works well and I really like the scent. I love that it's a deodorant not an antiperspirant! Would totally recommend this product! I wanted to stop using anti-perspirant and avoid products that are tested on animals, so I spent years searching for a vegan deodorant that actually works. 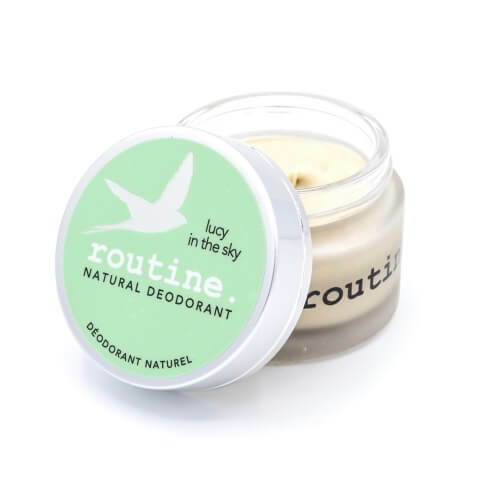 I tried almost every natural brand of stick deodorant under the sun, as I smell pretty strongly, especially when I'm stressed. None of them worked. Since trying this deodorant--that's made right in my hometown (Calgary)--I have not turned back; I have now been using it for _ 4 years. 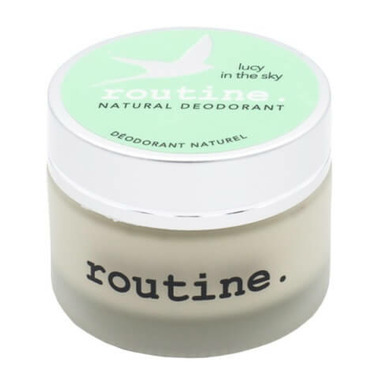 Lucy in the Sky is by far my favourite scent of Routine's deodorants. It is not too sweet and not too floral. One jar lasts about a year, as I only need about 1/4 - 1/8 of a pea-sized amount per armpit. I have sensitive skin and using too much can cause a very mild rash, which is part of why I use so little and spread it out thin--it prevents my skin from reacting to the baking soda. That said, it works like a charm, the jar lasts forever, and I never need to re-apply. I highly recommend this to anyone who has no luck with natural deodorants! This is my favourite scent of Routine. Really effective at keeping dry and clean smelling. I like the vegan formula better than the beeswax formula as the beeswax formula leaves white sweat marks if you sweat a lot (like on a hot day). I was so excited to try this product as I have heard rave reviews for it. Unfortunately, it caused a rash for me. I have never had a problem before with any mainstream commercial deodorants or natural ones, so this came as a surprise to me. The smell is nice - mostly lavender. I'm going to wait awhile before trying it again - I hope it was just a fluke that it caused a rash! I love the sent of this product (it is hard to shop for a sent online). The deodorant it keeps me feeling fresh and clean all day.. I've been using healthy deodorant for many many years. This is by far the best one. I ordered Lucy In The Sky and love it so much that I ordered the sample box to try out more. The scent of this is mainly lavender(similar to Meow Meow Tweet but maybe a bit sweeter)--if you are a lavender fan this may be a good option. I am not crazy about lavender so the scent was just okay for me. The aspect I did not like about this formula was it felt quite gritty going on...I prefer a smoother texture.